New Citroën Berlingo was named ‘MPV of the Year’ at the prestigious What Car? Car of the Year Awards in London last week. The judges praised the model for its spaciousness, efficiency and passenger comfort. 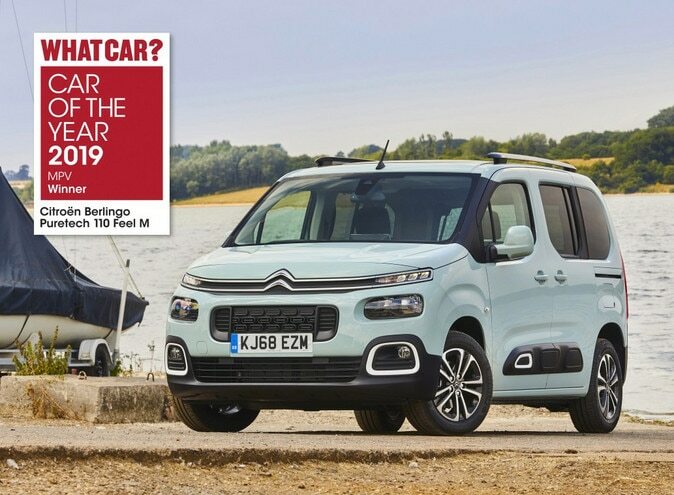 With more than 25,000 orders already placed worldwide since its launch in September 2018, New Berlingo – Citroën’s third-generation Leisure Activity Vehicle – has scooped the ‘MPV of the Year’ prize at the What Car? Car of the Year Awards. What Car?’s panel of judges recognised New Citroën Berlingo for its generous interior space, outstanding ride quality and competitive fuel efficiency. Steve Huntingford, Editor at What Car?, who presented the trophy at this year’s glittering ceremony at London’s Grosvenor House Hotel, said; “New Berlingo offers so much for so little. You’ll be hard pushed to find something so cavernous for the money. And with a ride that’s comfier than that of its rivals, which cost a lot more, similar levels of performance and fine economy, New Berlingo is a great all-rounder”. As one of the forerunners in the Leisure Activity Vehicle sector since 1996, Berlingo passenger models have been referred to as ‘vehicles for every occasion’. New Berlingo features class-leading interior modularity, including three individual rear seats and a new-generation Modutop® multi-function roof.